Lately, information pills paninis are everywhere I look. On the cover of Gourmet, drugstore inside Food & Wine, on the internet. Last night, I felt the need to satisfy the grilled sandwich craving. Since I don’t have a panini maker or grilling device, I’ll just call it a grilled cheese. Mine was stuffed with thinly sliced green apple, red onion, Jarlsberg & Cheddar cheeses and crisp watercress. I also thought it would be fun to make some dipping sauces. I always love to dip my sandwich triangles in something tasty, so I made two yogurt sauces: super spicy Sriracha and curry. I was partial to the Sriracha (because I’m obsessed with it), but they were both tasty and complemented the sandwiches well. I also made a nice green salad with fennel, arugula and walnuts, simply dressed with olive oil, a splash of sherry vinegar, salt and pepper. It was a lovely light meal for a weeknight that really inspires experimentation with different sandwich fillings and dipping sauces. Heat a large skillet on medium-low. If your pan is too hot, the bread will burn before the cheese melts. 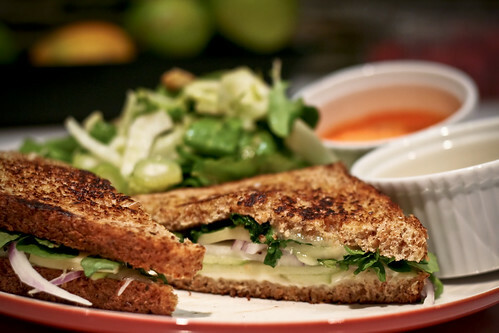 Assemble your sandwiches by layering the Jarlsberg, red onion, apple, watercress and cheddar. It’s important that the cheese is layered next to both slices of bread so that it’ll have a chance to melt. Lightly butter both sides of the sandwich and grill for 2 – 3 minutes on each side, or until the cheese is melty and the bread is lightly browned. Cut diagonally to serve (the triangles make for easier dipping). Simply mix your spice of choice with the yogurt. I find that 2 tbsp. yogurt to 1 tsp. spice works well, but feel free to experiment. *Sriracha is a Thai hot sauce that’s super spicy and garlicky. I put it on everything. **Maharajah-style curry powder is a blend of turmeric, coriander, cumin, cardamom, fenugreek, ginger, nutmeg, fennel, cinnamon, white pepper, black pepper, cloves, red pepper and saffron. My Indian spices are supplied by my aunt-in-law, who gets them from Penzeyâ€™s. Whisk the oil, vinegar, salt and pepper in a big bowl. Add the other ingredients and toss until fully coated. The apple/onion/cheese combo sounds quite good, as do your dipping sauces (great idea). I’d say it qualifies as a panino!